Creating Passionate Users: Aerons and Air Hockey... dot com excess or essential tools? Aerons and Air Hockey... dot com excess or essential tools? The Aeron chair. Air hockey. Espresso machines. Hip, urban design with a touch of MOMA. In the pre-bubble dot coms, aesthetics mattered. Having a fun workspace mattered. Having the best toys (including workstations, ginormous monitors, etc.) mattered. But when the dot coms went south they took the chairs and the toys and the stimulating workspace with them. We want them back. We need them back. You can keep the lame (and by "lame" I mean "WTF were they thinking?") business models, thank-you, but bring back our Aerons! The thing is, we all expect and understand why designers have--and need--creative work spaces, yet we somehow think programmers (or just about any other role that's not considered one of the "creatives") don't. We act as if programmers don't care about their environment. But you don't need to know an Eames from an Eero to appreciate the impact your environment has on your energy, creativity, productivity, and happiness. Way before the dot com days, I spent several years in Los Angeles working at design/creative shops, often as the sole programmer in a sea of artists. The first thing I noticed when I started working at these places was how good it felt to be in a place where the aesthetics were taken very seriously. Lighting, walls, materials, colors, floors, layouts, offices-with-doors (you can't be creative without some alone time!). I swear I wrote better code in those environments. Then I started working at game companies, where it was expected that everyone's workspace would be knee-deep in toys--light sabers, life-size Capt. Kirk standees, Lego masterpieces, vintage robots and other sci-fi kitsch, and of course--Nerf weapons. Once I learned to duck at the right moment, I swear I wrote better code in those environments. Then I went to work at Sun. Not the engineering part, in California, but the huge new Colorado campus. And while you were certainly free to dress up your cube any way you liked, and the coffee was pretty good, this was NOT the Sun that I'd heard about. No weird MIT-style pranks where someone's car is reassembled in their office over lunch. No, it was more like Office Space out here. Not that it wasn't light years better than a lot of--or most--tech companies, but the Colorado campus just didn't have the geek/festive mojo I'd expected. But then it got worse... I started working from home. It took me a long time to realize that it wasn't so much the other people that were missing, it was the stimulating work environment. I tried coffee shops and considered shared office spaces where other self-employed or work-from-home people can have some of the benefits of an office, but I actually prefer to work alone. It's not the people I miss... it's being in an environment that makes me feel creative and energetic. I want a space that matches my enthusiasm. 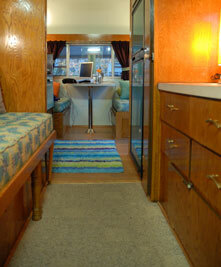 All that changed when I learned that Dori Smith had rented a 1957 Airstream office. 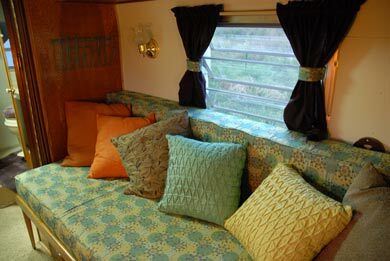 I'd lusted after Airstreams for years, and when I went to visit her, I knew it was exactly what I'd been looking for. And it's perfect. It's parked exactly two feet away from the side of the house (a house I share with my horse trainer and his wife), and the wifi from the house works beautifully. I haven't felt this good working in years. 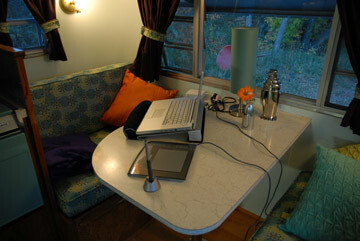 During my search I found a variety of people who use vintage trailers as their work studios, all equally thrilled. 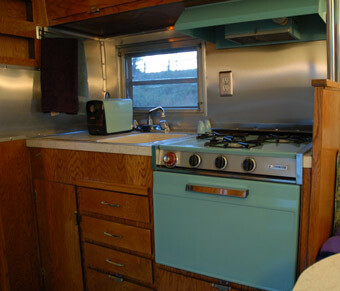 But I also discovered an incredibly passionate vintage travel-trailer community, especially over on Tincantourists. Don't underestimate the importance of your work environment, and don't be quick to consider things like Aerons and office aesthetics and toys wasteful. It's just the opposite. Apparently Joel Spolsky agrees. And my earlier post on the science of how dull environments hurt your brain. Don't for a moment think that the aesthetics and stimulation of your work environment don't matter! So, what have been some of your most stimulating work environments? And if you work from home, what are you doing to make it inspirational? That's awesome! 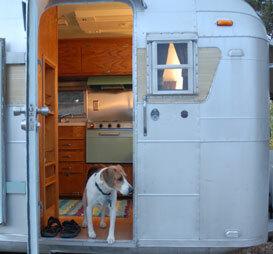 I've been dreaming of airstreams ever since I saw Chris Deam's updated design a few years ago. That's definately NOT too many pictures. That is one rad trailer! This confirms everything I assumed about you! To hell with the Aeron chair -- I would die without the newer, better Herman Miller chair, the Mirra. It's more comfortable, looks cooler, is flexible and doesn't bag me when I sit back on it, like the Aeron does. It's dreamboat, baby. Dream. Boat. You might also want to check out Tom Demarco's "Peopleware," which has a lot to say about this very subject. It's somewhat ironic that I read Joel Spolsky's article earlier today and it was all I could think about while reading your article. I can't believe I've never thought of this. You've solved so many problems for me with this post. The way our property is laid out makes this perfect. A brilliant post, Kathy, and a great affirmation about our need to PLAY. I agree that the environment can impact your work so much. 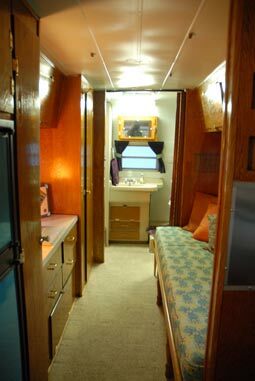 Now please note my official jealousy of the Airstream trailer. I'd LOVE that for a workspace – mine would be full of toys or spaghetti (I'd alternate), but it really is the perfect idea for a place to work. Very very cool. Great job on the trailer. I could not agree more about the design mattering. I just swallowed the purchase of 5 Herman Miller chairs for my employees. Heres to it paying off in the long run. I read Joel's take on programmers needing an office. I can agree, and, in a limited manner, do. But I've a question. What about pair programming? What about sitting together at a "round table" of computers so that all programmers are in relative sync regarding the project? Getting up to go to someone's office involves some breakage. Breakage in the person getting up, plus some breakage in "interrupting" the other person. I suppose the team could collectively allocate a block of "alone time," as the Signals call it. The rest of the time could be "team time." Still, it's upsetting to see so much emphasis on programmer's needing time alone and good equipment, but absolutely NO mention of agile practices. Providing these things to programmers will help them be the best they can be, I agree. But agile attitudes and object mindsets don't come about by sitting on the latest Aeron chair. Strangely lots of people don't think that programming is creative hence we don't need a sometimes quiet, nicely lit and inspiring place to work. I've worked in companies who have thought a server room is an ideal place to put a programmer, or that placing a programmer next to a sales person will not affect the programmer's working ability. Wow! That is just great. I have an Aeron, but I would definitely get rid of it for a trailer like that. I think it would also be a brilliant conversation topic with clients. Wow - what an amazing idea. 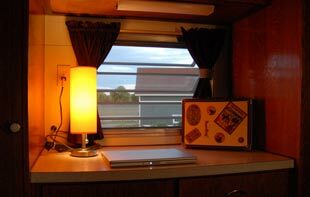 The little kitchenette is a nice touch. I find that getting up out of my chair, walking about and making a coffee or fixing a quick snack is a good way to get my subconcious working on a creative solution to a problem without breaking flow. Now this is cool! I have a remote-working colleague who built a cabin (detractors refer to it as a shed) in his garden, but he finds it cold in winter and hot in summer. When I work from home, I tend to sit at the diningroom table, which is bar-counter height, so my feet don't reach the ground. Not comfortable. Or I slouch on the couch with my laptop on... well, on my lap. Not good for one's back. I really must revisit this - you have inspired me. I completely agree - a creative, inspiring environment is essential for me too. On a practical note, how do you get Wifi in and out of that tin can? I'm a programmer working out of a home office and after reading your article I think I need to rethink how I have my office setup. When I moved into my townhouse I also moved up into a separate bedroom and office which was great, but that's gotten old. It's like I'm running on empty and there isn't a gas station in sight. So it's time to get creative. You are great - I loved this post and I absolutely love your website. Every time a new one comes out I try to integrate your ideas into the product that I am selling. Out of the fifty+ blogs I am subscribed to (rss), yours is the first one I look for to see if a new post is available. I have a ton of them "starred" in my google reader account! Yours is the only blog that I am bummed about when you miss a day or two! Awesome post. And I'd totally agree with the whole "environment-o-creativity" thing. take a look at "10. The more talented somebody is, the less they need the props." Interesting to think about. How much of my creativity is the props getting me "in the flow", and how much is my innate, internal passion to do it, damn the torpedos full speed ahead!